Liar’s Poker recasts the bluffing spirit of the game of poker into an I Doubt It-style affair, doing away with the gambling aspect altogether. That makes it an excellent game for younger players, or to familiarize new players with the poker hands. It can be played with two to eight players, but is best with three to five. The object of Liar’s Poker is to successfully determine whether the active player in fact has the hand they claim to have. Liar’s Poker is played with a 54-card deck of playing cards, formed by adding two jokers to a standard 52-card deck. 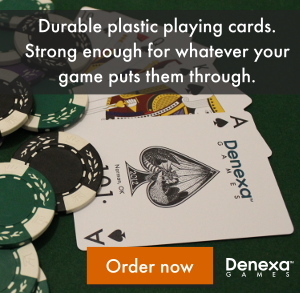 We’d be lying if we said we didn’t wish you’d use Denexa 100% Plastic Playing Cards in your game. You’ll also need something to keep score with. Pencil and paper is fine, but it’s much simpler to use a supply of markers, such as poker chips. Select the first active player by any convenient means, such as mutual agreement or high-card draw. Shuffle and deal five cards to that player only. The rest of the deck becomes the stock. The first player looks at the five-card hand they have dealt. They then declare any standard poker hand that they assert the hand contains (jokers act as wild cards). They may simply declare the hand type that they purport to hold (e.g. “a pair”), or they may declare more specifics, such as “a pair of 10s”, “a pair of 10s with an ace kicker”, etc. The player to the left of the active player must decide whether or not they believe the declaration. If they do, they accept the hand, and the cards pass to that player. The new active player then looks at the cards. They don’t reveal whether or not the declaration was true or not. Instead, they may discard up to four cards, face down, and draw new ones to bring the hand back up to five cards. They must then make a declaration higher than that of their predecessor. This may be a wholesale improvement in the hand (e.g. going from “a pair” to “two pair” or “a pair of 5s” to “a pair of 9s”) or it may disclose more information than the previous one. For example, if the previous player declared “a pair of jacks”, then “a pair of jacks with a queen kicker”, “a pair of jacks with a 7”, etc. would qualify as a higher declaration. 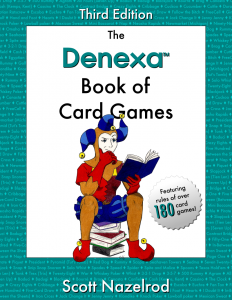 If a player doesn’t believe a declaration that has been presented to them, they call “Liar!” If the declaration was honest, then the active player reveals just as many cards needed to prove the declaration correct, and the doubter is given one point. Otherwise, the cards are discarded, face down, and the liar gets one point. In either case, the cards are shuffled. The player that scored the point is dealt a new hand and becomes the new active player. Game play continues until one player reaches a predetermined number of points. The player with the lowest score at that point is the winner.